Engineers at University of Missouri and spin-off company Nanova Inc. in Columbia, Missouri plan to soon begin clinical trials of a device to painlessly replace tooth fillings. 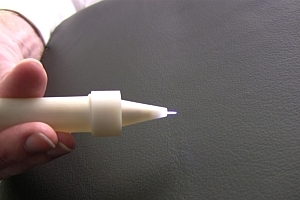 Research and development of the plasma brush, as the device is called, was funded by National Science Foundation and Small Business Innovation Research (SBIR) grants from National Institutes of Health. The plasma brush uses chemical reactions to disinfect and clean out cavities for fillings, usually in less than 30 seconds. Those chemical reactions involved with the plasma brush, say the developers, actually change the surface of the tooth, which allows for fewer voids and a stronger bonding with the filling material. Hao Li and Qingsong Yu, Missouri engineering faculty, along with Meng Chen, formed Nanova to commercialize the research. Chen is the co-holder of the patent on the technology, along with University of Missouri. Human clinical trials are expected to begin in early 2012 at the University of Tennessee-Memphis. If the studies succeed and the FDA clears the device, the researchers indicate the plasma brush could be available to dentists as early as the end of 2013. The following video tells more about the plasma brush.